Our neighborhood in downtown Austin is hard to delineate, so in this entry I’m just writing about the streets on our immediate block….Colorado Street on the west, Second Street on the north, Congress Avenue on the east and First Street / Caesar Chavez on the south. Our building shares a block with the 100 Congress office building. Now 100 Congress should not be confused with 100 Congress Plaza. 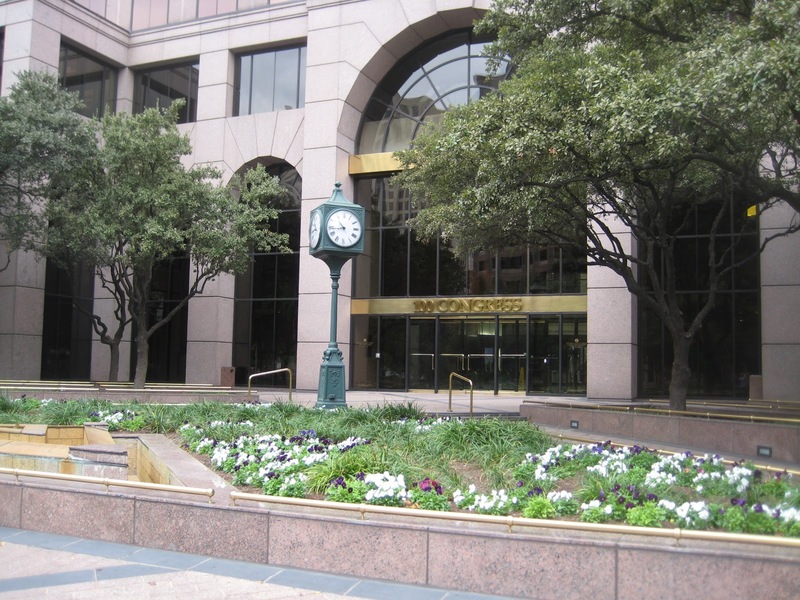 As everybody knows, 100 Congress is on west side and 100 Congress Plaza is on the east side of Congress Avenue. The front entrance to 100 Congress is nice but unassuming. A police officer usually guards the parking garage entrance on Second Street so Bill and I think that Something Very Important must take place inside. Some of the apartments in our building directly face 100 Congress. Fortunately our apartment is on the other side so the office workers have to look in other people’s windows instead. The Austonian condominium building is next to the museum on Second Street. This 55-story building is the tallest in Austin. Bill and I toured the building before it opened, back in those lazy pre-downsizing days. The view from the exercise room on the top floor is spectacular and would motivate anyone to exercise. New restaurants are planned for the first floor but none have opened yet. 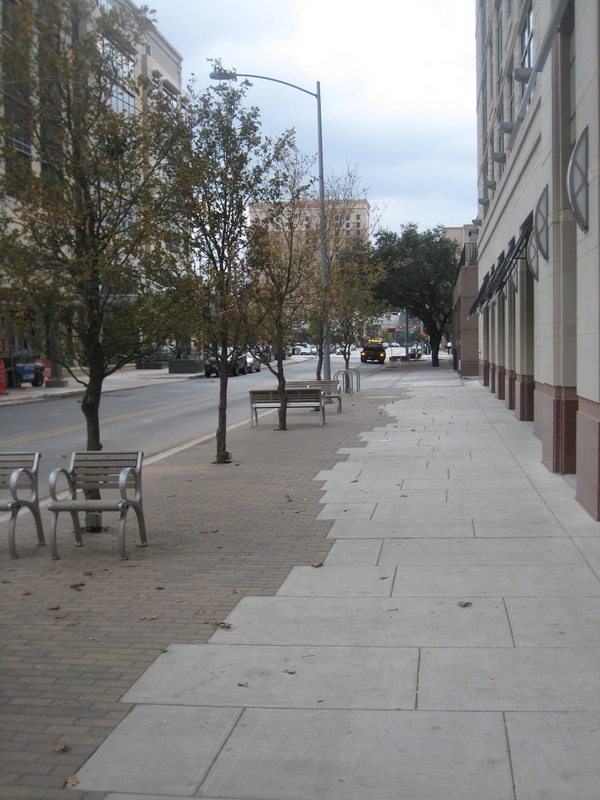 Trees and benches line the sidewalks on both Second Street and Caesar Chavez. Bill and I know the timing of the crosswalk lights now, although we are not against jaywalking in a pinch. We feel very safe walking around our neighborhood after dark. People are always walking to and from restaurants or clubs. The attendants for the Austonian’s valet parking are usually looking up and down Second Street as well. I am purposely leaving out the best parts of our neighborhood: the hike-and-bike trail and the rest of Second Street. I promise to add more entries soon! Did you ever think, after all the years of visiting the old Children’s Museum on 5th, that one day you’d live across the street from the fancy new one? Hmmmm. We never know where we’ll end up. Thanks for the in-depth info! Thank you both for following and encouraging me! I feel like such a novice blogger! 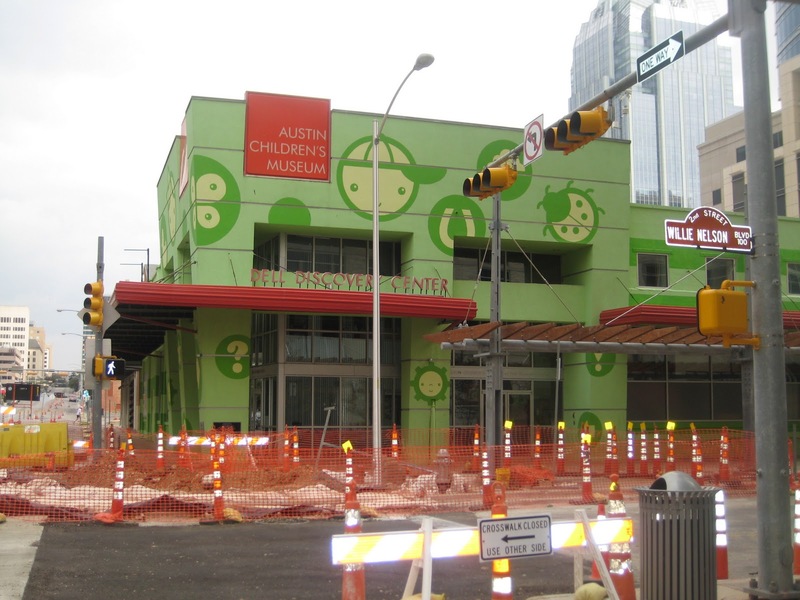 Seeing the pic, I am so itching to go in the children’s museum.